Old Garden Roses (OGR's) are those classes of roses which were known before 1867, the date the first hybrid tea, La France, was introduced. The major classes include: albas, bourbons, centifolias, chinas, damasks, gallicas, hybrid perpetuals, mosses, noisettes, portlands, species, and teas. There are lesser known OGR classes including: ayrshires, boursaults, eglantines, etc. All roses belonging to these classes are OGR's, even if the individual variety was introduced after 1867. Species roses are the origin of all other rose classes, and often called "wild roses." They existed long before man by some 33 million years. They are usually single petalled blooms on plants from 18 inches to over 20 feet. Rosa foetida bicolor, or Austrian Copper (prior to 1590), is a commonly grown species rose. Most species are listed by their Latin name, beginning with "Rosa." 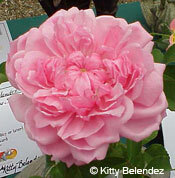 There is also a double, or plena form of which Rosa roxburghii (1814), or the Chestnut Rose, is a good example. In Graham Stuart Thomas' book Old Roses, he presents a chapter by C. C. Hurst, a renowned rose geneticist. Mr. Hurst claims that all modern rose classes come from four main species: Rosa rubra (Rosa gallica), Rosa phoenica, Rosa canina (Dog Rose), and Rosa moschata (Musk Rose). However, Rosa foetida, Rosa gigantea, and Rosa chinensis played a large part in the development of chinas, teas, and hybrid teas. 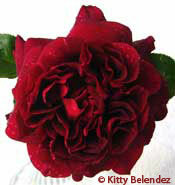 Gallica roses are one of the oldest rose classes. They are once-blooming, small, bushy plants to 4 feet tall, with soft, fine thorns. The deep furrowed, rough leaves tend to grow outward or upward from the stem. 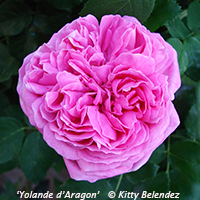 Gallicas are well-known for their fragrance and intense colors, thus earning them the nickname, "Mad Gallicas." This class was popular from the early to mid 1800's. 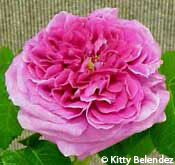 Charles de Mills (unknown date) and the striped Rosa Mundi (before 1581) are common gallicas. 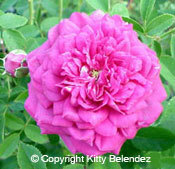 Alba roses are once-blooming, upright, dense, tall plants (to 6-feet plus), which are very hardy and disease resistant. They are characterized by their soft blue-gray foliage and their stems with sparse, uniform thorns. Albas are believed to be a cross between Rosa canina and Rosa gallica, and were popular from the late 1700's to mid 1800's. Königin von Dänemark (1826) is one of the few pink albas and one of the most popular, along with Alba Semi-Plena (prior to 1867). 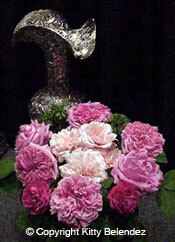 Damask roses are known for their intense, heavy fragrance. Large pink or white blooms form on a medium sized plant (to 5 feet), which has a "mixed bag" of thorns. The foliage is large, matte, and folded to form a "V" down the center. The terminal leaflet in most damasks bends downward. Damasks are believed to be a cross between Rosa phoenica and Rosa gallica, and were popular through the 1700's and 1800's. Leda (1827) and Rose de Rescht (1940) are two of the most popular repeat-blooming damasks, even though Rose de Rescht may be misclassed. Ispahan (before 1802) and Marie Louise (1813) are two of the more popular once-blooming damasks. 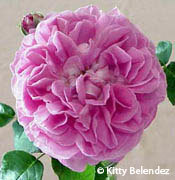 Centifolia roses are the "cabbage roses" made famous in still-life paintings by the Dutch masters. Centifolia, or "one hundred petals," are tall plants over 6 feet, that are once-blooming. They mostly produce pink blooms and are known for their large showy sepals. They are believed to be a cross between Rosa damascena and Rosa alba, and were popular from the 1600's through early 1800's. Cabbage Rose (1596) and Fantin-Latour (unknown date) are two popular large centifolias, while Rose de Meaux (1789) and Petite de Hollande (1838) are popular dwarf centifolias. 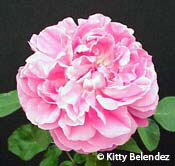 Moss roses were named because of the mossy growth on the peduncles and sepals. This "moss" releases a piney fragrance when rubbed between the fingers. The original moss rose was a sport of Cabbage Rose, although there is some evidence that damasks will also create moss sports. Most mosses are once-bloomers such as Crested Moss (1827). It is also known as Chapeau de Napoleon (Napoleon's Hat) as the sepals resemble the three-sided hat worn by Napoleon. Mosses are 3-6 feet tall plants. Some are repeat-bloomers, such as Salet (1854), one of the best exhibition mosses. China roses are repeat blooming, small plants from 18" to 3 feet tall. Most chinas have stems too weak to support the small, non-fragrant blooms that usually come in clusters. Green Rose (1845) is commonly seen at shows and makes a great filler material for rose arrangements. Chinas are also well known for their dramatic color change. Most will start off yellow or light pink, then change to deep pink or red before the petals fall off. Mutabilis (1896) produces this effect in grand fashion. Tea roses are small to medium-sized plants to 4 feet tall. Some have good "hybrid tea" form, like Catherine Mermet (1869), but most open flat and full like Sombreuil (1850), one of the great exhibition OGR's. Teas are generally known for their large blooms on weak stems which cause the bloom to "droop." These roses are believed to be a cross between Rosa chinensis and Rosa gigantea, where the alleged "tea" scent came from. Portlands. From the rose Autumn Damask, comes a short lived class called portlands. They are small, repeat blooming plants to 4 feet tall, with short peduncles, creating an overall appearance that the blooms "sit" in the foliage. 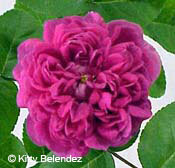 Comte de Chambord (1860) and Rose du Roi (1815) are two of the most popular portlands. Portlands were popular in the mid to late 1800's. There are less than 20 portlands commercially available today. Bourbon roses. An alleged chance cross between Autumn Damask and a china resulted in the bourbon class. Bourbons are a varied class. Most are repeat-blooming plants from 2 to 15 feet tall, with fragrant, full, and often quartered blooms. They were popular from the mid to late 1800's. Souvenir de la Malmaison (1843) and Louise Odier (1851) are two popular varieties in this class and are great show roses. 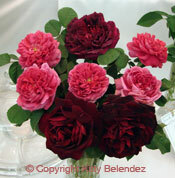 Hybrid perpetual roses are the most commonly grown OGR's and the ones most likely to be seen at shows. They were very popular in the mid to late 1880's when there were more than 4,000 varieties available. Most hybrid perpetuals are repeat blooming, tall plants over 6-feet, with full, fragrant blooms in mostly pinks and reds. Paul Neyron (1869) has the largest blooms of all Old Garden Roses and is very popular, along with Marchesa Boccella (1842) and Baronne Prévost (1842). Hybrid perpetuals have a complex family history, coming mostly from bourbons, chinas, portlands, and teas. 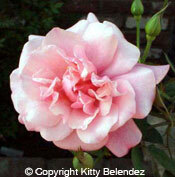 An interesting rose trivia question is to ask the name of the only rose class that originated in the United States. Answer: the noisettes were created in 1811 by John Champneys of Charleston, South Carolina. Noisettes are large, repeat-blooming, rambling plants up to 20-feet tall, with pliable canes. The blooms are usually produced in clusters, as with Nastarana (1879). They were also crossed with tea roses which produced large, single blooms, instead of clusters, such as with Madame Alfred Carrière (1879) and Maréchal Niel (1864). For exhibiting, Old Garden Roses and shrubs may be shown with one set of a stem-on-stem condition, such as a "dog-leg," where the new growth emanates from older wood. The ARS Dowager Certificate is awarded to the best Old Garden Rose introduced prior to 1867, which includes "ancient," and those with unknown dates, but are known to have existed before 1867. The ARS Victorian Certificate is awarded to the best Old Garden Rose that was introduced during or after 1867, or has an unknown date of introduction. A new ARS Certificate for older shrubs and species is the Genesis Award. Pruning Old Garden Roses is not difficult: Don't, if you can help it. Once-blooming OGR's should be moderately pruned right after blooming. The only winter pruning necessary is to remove dead or diseased canes completely. 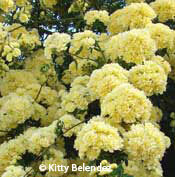 Repeat blooming OGR's can be pruned back 1/3 safely, but some can be pruned harder, such as Marchesa Boccella. As with modern roses, remove dead, diseased, crossing, and small growth. OGR's less than three years old should not be pruned. Shrubs roses are not Old Garden Roses. This class originated as a catch-all group for roses that didn't fit into a specific class, therefore, Shrubs are the most diverse of all rose classes. 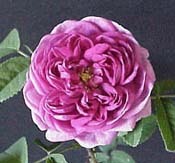 There are two general types of Shrub roses: those listed by a family name, such as hybrid musks, hybrid rugosas, and kordesii, and those simply listed as (S) in Modern Roses and the Handbook For Selecting Roses, which includes English Roses, Griffith Buck Roses, Landscape Roses, and Ground Covers. Stemler National Challenge Trophy Winner at San Jose 2002, Shown by Bob & Kitty Belendez. The roses are 'Rose de Rescht', 'Yolande d'Aragon', 'Green Rose', 'Anna de Diesbach', 'Irene Watts', and 'Baronne Prevost'.